You want to make some pies but are dreading trying to make a gluten free pie crust. Maybe you’ll go to the store and see how much they want for one. $10 bucks! Then you glance at the ready made pies in the freezer case. $12 bucks for something that will feed a mouse (well maybe a little more). Already your purse feels lighter just looking at the prices. Does that mean you can’t have pie for dessert? Does that mean you will have to ride your bike into work this week cause you have no gas money? Does that mean desert will be ruined? No way! The Gluten Free Maven is here to save the pie day ! Seriously, this is a no-brainer, stupid easy gluten free pie crust, just the way I like it. Few ingredients and you get to pat it in the pan. How easy is that. It’s like playing with play dough all over again, except this tastes good. Enough talk: on with the recipe. Place the gluten free flour blend, xanthan gum ( if using) and salt in the bowl of a food processor and pulse 4 times to combine. Take off the top and drop the cream cheese and butter in a circle on top of the flour. Place the lid on and pulse until it just comes together. You can refrigerate the dough, tightly wrapped, for up to 3 days. Wrap and place inn freezer bags to freeze for up to 1 month. Preheat the oven to 375 degrees. BE sure to chill the dough for 30 minutes in the freezer or 1 hour in the frig first. 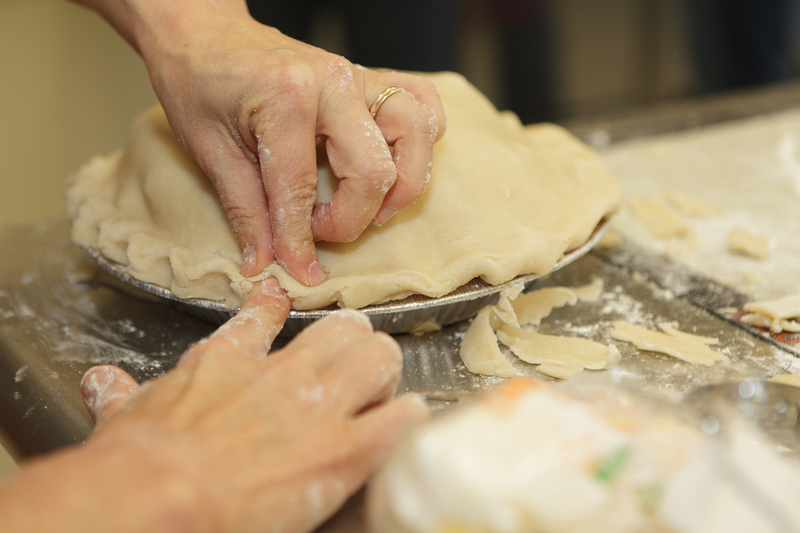 Pat the dough into the bottom and up the sides of a pie dish. Prick the bottom and the sides with the tines of a fork first to keep it from bubbling up. Bake for 12 minutes or just barely browning. Fill and bake the pie as directed in your recipe. Pat the dough into a flat disk. Wrap in plastic wrap and place in the freezer for 30 minutes or in the refrigerator for 1 hour. Take out and roll between two pieces of plastic wrap or parchment paper and place on top of the pie filling. Bake as directed for the type of pie you are making. Double ingredients and divide dough in half.Pat in the bottom crust and follow the directions for the top crust. Or follow the directions for the top crust if you want to roll out the top and bottom crusts. Up to you. This crust is very tender and super yummy. Be very gentle if you decide to roll it out. It’s fairly fragile. If it tears on you, just go ahead and push the torn edges together, just like you would if it was a regular pie crust. This pie crust is not for making frozen pies. It does not freeze well as a baked pie, especially with fruit, as the juices tend to make it soggy. You can help to combat that by doing a few things. 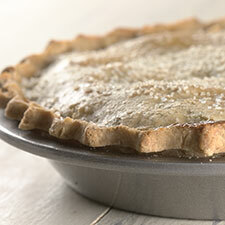 Make sure to pre-bake the bottom crust if you are making a crumble type pie. If you are doing a double crust pie, brush the entire bottom of the crust with a thick fruit butter ( I usually use apple butter) as this will help to “seal” the bottom and not make it as soggy. I also add tapioca starch or cornstarch with my apple slices to help thicken the filling for my pies. Less runny filling helps to keep the pie from becoming soggy too. PS. If you have any hints or tips for keeping your bottom crust from becoming soggy, let us know! This pie recipe was excellent, but substituting 1/4 cup corn starch and 1/4 tspn. Zanthan gum for 1/4 cup gluten free flour mix lightened up the crust quite a bit. It did NOT freeze well. Try using the same amount of xanthan gum, but replace the corn starch with tapioca flour instead. Try that and see. My gut does not like xanthan gum AT ALL! Is there anyway around having to use it? You can also use guar gum or Psyllium Husks. With guar gum, just swap out for the same amount of xanthan gum. To use psyllium husks you will need to add twice as much to make it “hold together”. Either “gum” works better with small amounts.